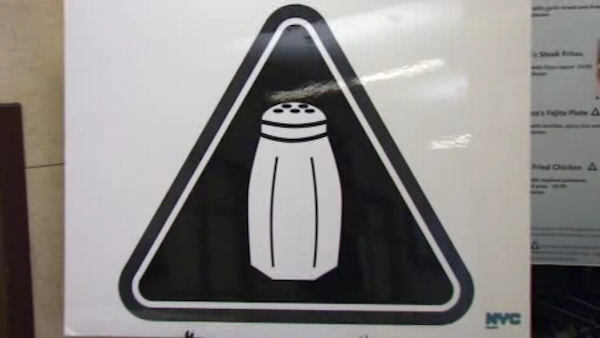 NEW YORK (WABC) -- A law forcing large New York City restaurants to post sodium warnings on their menus will not go into effect tomorrow as originally planned. The law would require many restaurants to post salt icons on menus next to foods that exceed the daily recommended amount of sodium. But, New York City menus will remain salt-icon-free, at least for a little while longer. Today, an appeals court granted a temporary restraining order after an appeal was filed by the National Restaurant Association. "The Association is pleased by today's decision to grant emergency relief for the men and women that own and operate New York's restaurants from this unlawful and unprecedented sodium mandate," said the National Restaurant Association in a statement. "We look forward to a full and fair opportunity to make our case before the Appellate Court." The New York City Department of Health and Mental Hygiene has no intention of straying from their plan. "We are confident, despite the stay of enforcement for now, that the court will uphold the sodium warning rule," said the New York City Department of Health and Mental Hygiene in a statement. "The Health Department will continue to warn chains if they are not compliant, but will not issue violations while the stay is in place. The sodium warning remains critical information New Yorkers need to protect their hearts and their health."